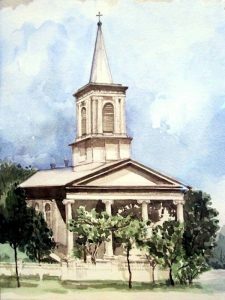 The original Saint Mary’s Church was built in 1833 on the south side of Lake Street, west of State Street. The building was moved to the northwest corner of Michigan at Madison in 1836 where it was enlarged and an open belfry added. In 1843, with the establishment of the Diocese of Chicago, St. Mary’s Cathedral was built on the southwest corner of Madison at Wabash. The original wooden structure was cut in half and moved to the grounds of the cathedral where the first Catholic grammar school in Chicago was established in 1846. 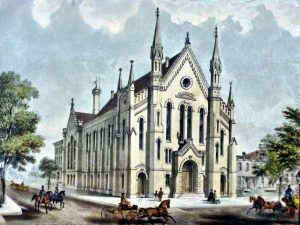 When the Cathedral was destroyed in The Great Fire in 1871 and plans were made for a new cathedral parish (Holy Name) north of the Chicago River, the Plymouth Congregational Church at 9th and Wabash (which had survived the fire) was purchased and became known as Old St. Mary’s. The parish was placed in charge of the Paulist Fathers on October 12, 1903. In 1904, Fr. William Finn established the internationally acclaimed Paulist Choristers, a sixty-five voice choir of men and boys. Fr. Eugene O’Malley was the choir director from 1928 until its final season in 1967. Old St. Mary’s at 9th and Wabash fell into disrepair and was demolished in 1971. The Old St. Mary’s Chapel at Van Buren and Wabash became the new site for Old St. Mary’s Church. 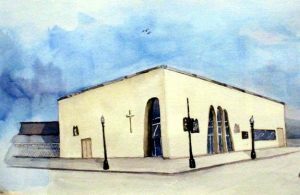 On July 21, 2002, the parish community proudly dedicated their new church (1500 S Michigan), one of architectural beauty and distinction. We are very grateful to those who contributed to the Beacon of Faith Campaign which made this facility possible. Soon it became clear that there would be a need for a new educational ministry because of the number of young families who moved into the neighborhood and their desire for a faith-based, quality education for their children. Located on the new church site were rooms constructed from a former charter school. As parents started to meet in 2003, they expressed the strong need for an educational alternative in the near South Loop because of the lack of schools, and particularly schools with a Catholic foundation. After many months of discussion, plans were finalized. Old St. Mary’s Catholic School is now a reality, a new adventure in faith to mirror the new adventure of the whole South Loop, the recreation of a city in the heart of Chicago. 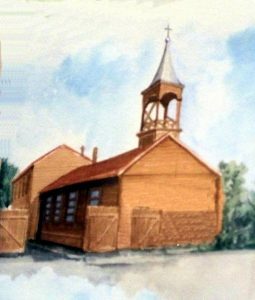 In September, 2004, Old St. Mary’s Catholic School opened its doors to its first preschool class, with Barbara Spaniol-Smith as its first principal and teacher. A school board was formed and the reputation of the school grew in the neighborhood. In 2011, a new school building opened to over 260 students. Enrollment has increased each year since. We encourage you to contact the school office and make an appointment to tour our facility.